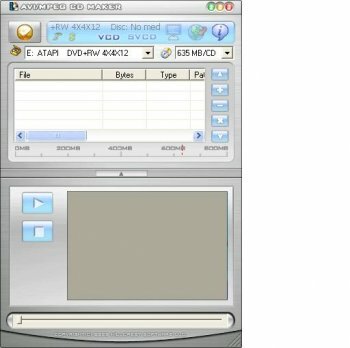 AVI/MPEG CD Maker can burn your AVI/MPEG files to VCD/SVCD! Simple operation: It is designed for the users’ needs. You can run it easily. A smart interface:The interface screen is as bright and translucent as crystals, which will bring you comfort and pleasure when using it. The preview function offered :You can roughly preview your VCD/SVCD before the real burning . Compatible with most CD Writers.